The star of the History channel’s reality TV show, “Ice Road Truckers” died on Sunday after his plane crashed on the way to Montana from Dallas. 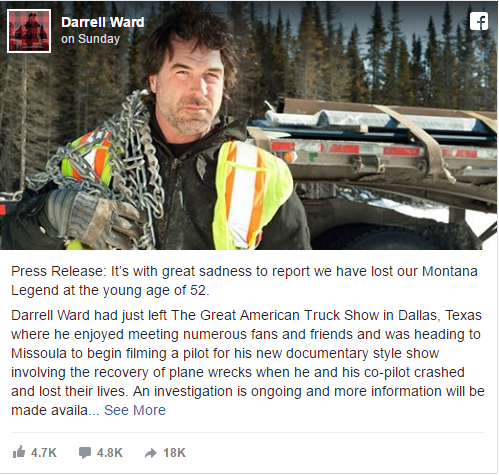 The TV star, Darrell Ward, 52, attended the Great American Truck Show in Dallas over the weekend and was on a plane to Montana when it crashed in Misoula. In an ironic fashion, Ward had been planning to film a pilot episode of a show about what goes into recovering a plane crash. Pilot Mark Melotz was attempting to land on a small air strip when”something went drastically wrong,” Missoula County sheriff’s Capt. Bill Burt told ABC 11 on Sunday. Family and friends that were awaiting his arrival said that the plane began to stall and then hit a line of trees. An investigation is currently underway by The National Transportation Safety Board and the Federal Aviation Administration. See The Bunker Busting Rockwell B-1 Lancer In Action!